Whether you’re seeking an engagement ring for your bride-to-be or a watch for your son’s graduation, it can become an important family heirloom for many years to come. At Grace Jewelers, our highest hope is for you to receive the perfect piece and we’ve helped hundreds with just that. We work with you to take an idea and formulate it into a beautiful treasure that seamlessly fits. Browse our creations below. Before we begin, we encourage you to look at everything we have in stock to gather ideas about your personal style. Then, we sit down and discuss the vision for your unique piece of jewelry. This is one of the most important steps because it is when we truly focus on what you've been envisioning and make sure we know every detail. This step also occurs during the initial consultation. 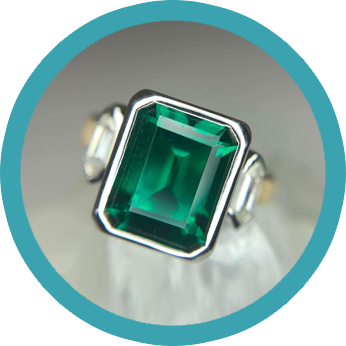 For the gemstones we have in stock, we like to have various grades, from low to high because some people like lower grades as they have more character. We also have magnification available so that they can look deeper into the stone and see if they like all of the intricate characteristics. If you'd like a particular gemstone that we don’t have in stock, we will order it with specific preferences for shape, cut and grade. Finally, we arrive at the most exciting part of the process - Creation. We will use a design favorite, the Grace Signature Solitaire, as an example. This ring is a single stone in a bezel setting. First, we solder the shank, which is the band of the ring, to the bezel, which holds the gemstone. Once the foundation is complete, we set the stone.We will then place the stone in the bezel, which is basically a small cup, and once the stone is in place, we hammer in a circle around the bezel until it is flush tightly against the stone. The final touches include the finish and polish. Our signature style is a hammered finish. If a hammered finish is not preferred, we can do a standard bright polish finish. To truly make the piece a Grace Signature ring, we will engrave Grace on the interior of the band along with a stamp indicating the type of metal that the ring was crafted from.